You can use any fresh crab meat, Cromer crab is a bonus. You could also use prawns if you prefer. Increase the number of artichokes and ingredients for more than two people. Cut away the top outer leaves of the artichoke and cut off the top inch (2.5 cm). Peel the base all the way round and remove the choke. 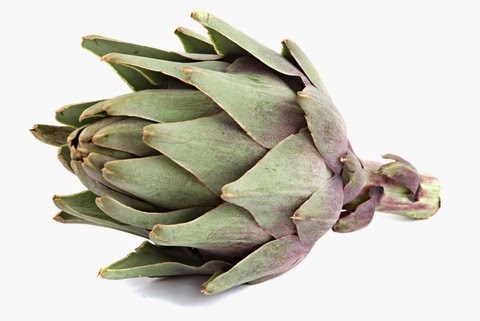 Rub lemon juice all over the exposed artichoke and put into water immediately to stop them going black. Boil a large pot of water. Add 2 tablespoons of lemon juice to the water. Add the artichokes to the water, reduce to a simmer and cook for 45 minutes until soft, you can use a sharp knife to check them. Drain well on kitchen roll and while they are still warm press the leaves back, remove and discard any remaining choke and spiky leaves. What you want is the heart. Chill the artichokes. To make the salad, combine the remaining ingredients in a bowl. Stuff each artichoke with some of the filling and place on a plate, scattering around any remaining salad. Finish with a choice of a drizzle of a nice vinaigrette, mayonnaise or melted butter.